Remember the function served by plants and structures is more important than their appearance. In other words, don't base your planting decisions solely on what a plant looks like. 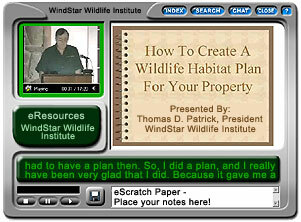 Following are WindStar Wildlife Institute's plant recommendations for wildlife habitats in Connecticut. Connecticut is New England's second smallest and southernmost state. The southerly flow of the Connecticut River divides the state roughly in half. The coastal plain and central valley are relatively flat; they contain most of the larger cities. Other parts of the state are hilly, with the highest altitudes in the northwest corner. Hills are largely covered with hardwood forests, and about two-thirds of the state is in open land. The Connecticut Botanical Society can provide lists of native plants for a specific region.